NISSWA, Minn. – Employees of Nisswa-based MicroNet, Inc., the market leader of member management software and services, recently joined together and volunteered at Timber Bay Camp and Retreat Center near Onamia. 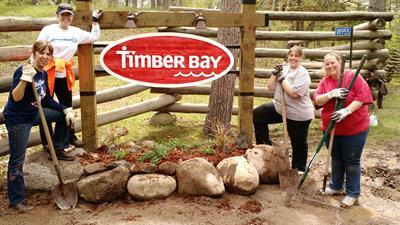 Timber Bay actively serves youth from across Minnesota. MicroNet CEO Scott Juranek and members of the MicroNet team donated their workday, pitching in to help prepare facilities for the summer season. Employees collaborated on several projects which included rock work and landscaping near the entrance, raking and clean-up, and the installation of two docks. The day also included a facility tour and lunch.